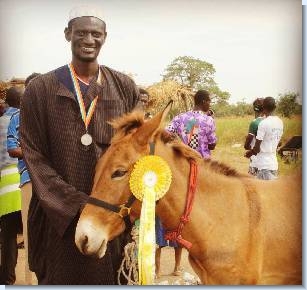 Every year, usually in December, the Gambia Horse and Donkey Trust hold an Annual Horse and Donkey Show for the local people to compete for prizes against others from their local community. 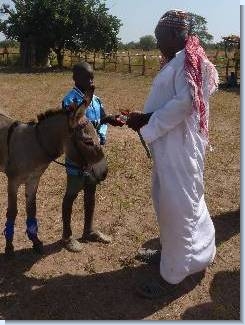 The Annual Horse and Donkey Show is an opportunity for Gambians to gain rewards for taking excellent care of their working animals, and it provides proof that it IS possible to maintain a healthy working animal in The Gambia, despite the difficult living conditions and prevalence of tropical diseases. 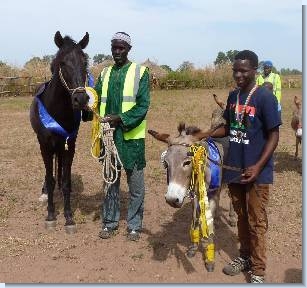 Without such luxuries as lorries or horse boxes, Gambian horse and donkey owners are known to walk for several days with their animals to attend the show and to be in with a chance of winning a prize. Classes are judged on a combination of condition of the animal and how well the animals are handled by their owners. 2013s annual show saw almost 200 horses, donkeys and mules in attendance and once again the overall standard of the animals had improved since the previous year. Over the 7 years that the show has taken place, the general health of competitors has improved year on year. In the year that the show was initiated it was difficult for judges to choose a winner because so many animals were in poor condition; in recent years it has become more difficult to choose winners because the general condition of the animals is so good, particularly that of the donkeys. This is in part down to the fantastic success of our educational programmes, teaching both children and adults how to take good care of their animals. This improves the lives of the animals and also enables the animals to be more productive for their owners who rely on them for their own survival. Alongside the normal showing classes our Donkey Cub children also demonstrate a Donkey Ball tournament on their own donkeys. This is always a real highlight for the spectators and the condition of all the donkeys who are in the Donkey Ball teams proves that this initiative has genuinely improved the welfare of the animals, and the attitudes of their young owners who now think of their animals as athletes! The show is also an opportunity for us to distribute head collars to the equine owners, to minimise the number of animals who are tethered by their legs - the cause of many broken legs. We also have a team of vets who provide free veterinary treatments on the day and a free blood testing service for all competitors to test their animals for Trypanosomiasis (Sleeping Sickness in humans). This is a very common disease among equines in The Gambia, and is easily treated if infection is found. Any competitors found to be positive for Trypanosomiasis are treated by the veterinary team. 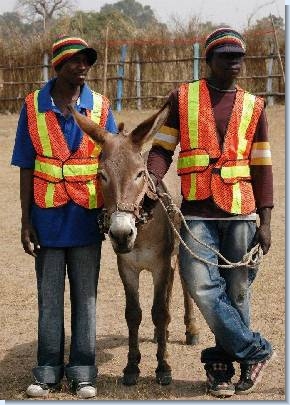 Locally trained farriers are on hand to provide a trimming service for all attendees, and fluorescent reflective jackets that have been kindly donated are also distributed. It has become a well known event throughout The Gambia, and one that the local people look forward to for months before hand. It has created a real motivation for people to keep their working equines healthy during what is normally a very difficult time for the animals - at the end of the farming season when they have been working hard. The show is televised throughout The Gambia, and attended by many Gambian dignitaries. 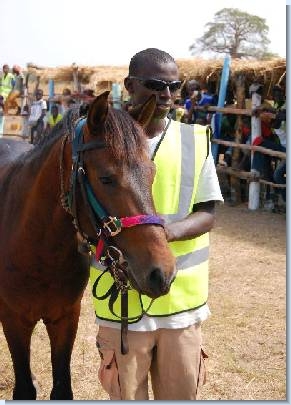 Although the event is great fun for all who attend, it is also an important platform to help to raise the profile of the plight of working equines in The Gambia. Huge progress has been seen in the way that animals are cared for in the Central River Region of The Gambia since the Gambia Horse and Donkey Trust began its work almost 12 years ago, and we are hopeful that there is even more positive change ahead.